The Aces taken on the steps of the venture hall. 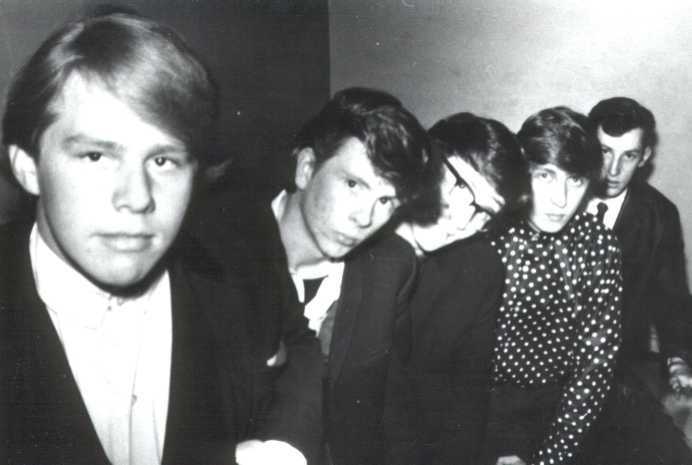 Top left: Martin Jones Bass guitar, Geoff Binnion Drums, David Clayton Vocals, Barry Rogers Rhythm and vocals, and Tony Brunee lead guitar.bottom right. Is there are any 'OLD FANS' out there??? Another photo of Brymbo's only ever rock stars!!!! The Brymbo group was started by Barry Rogers in 1958 formerly of the George and Dragon Pub. 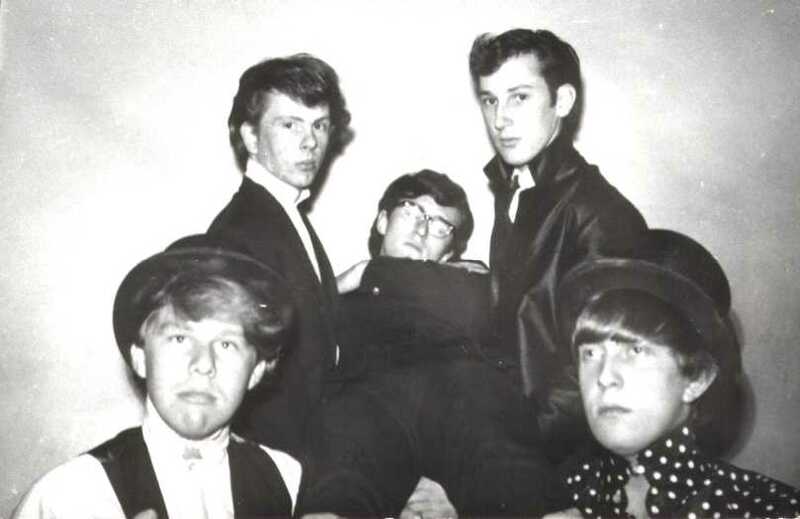 The group started as a skiffle group after the influence of Lonnie Donnigan and later progressed into the Mersey Sound influenced by the Beatles. During the sixties they enjoyed significant success in north and mid wales and on mersey side, playing the big clubs and dance halls. Played regurlarly at many big events supporting the big bands of the time. 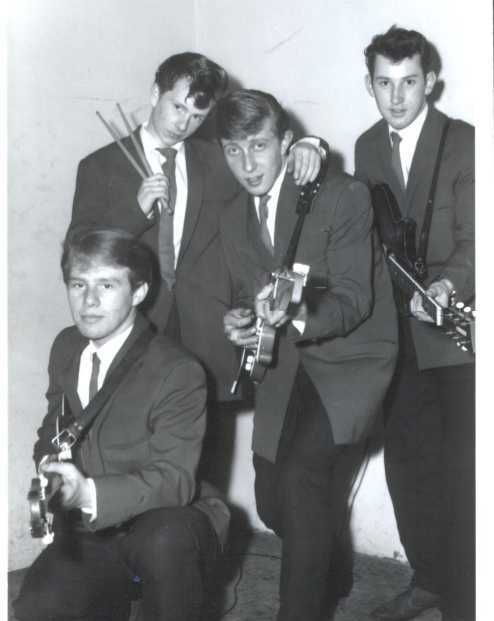 The Aces were also the resident band at the venture hall in Brymbo through the sixties and generated a large weekly following of weekly fans. Line up left to right. Barry Rogers rhythm guitar, Martin Jones Bass guitar, Geoff Binnion Drums, Tony Brunnee lead guitar, and David Clayton vocals. 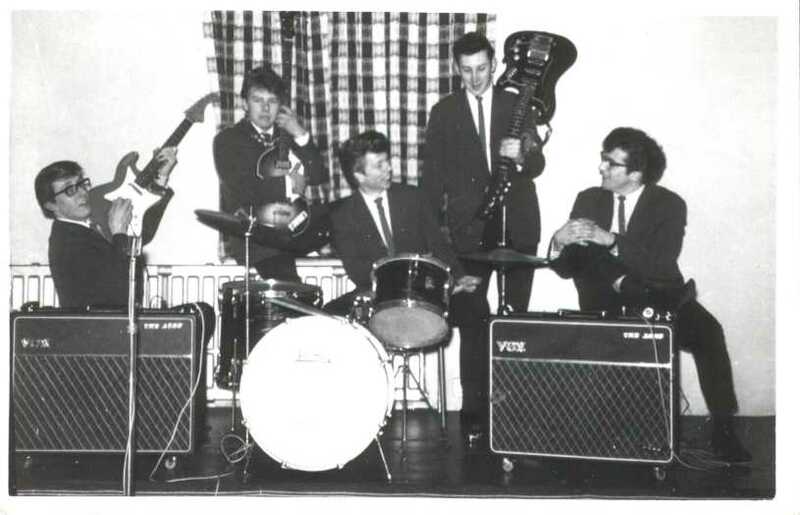 Martin Jones Formed a new bandwith 4 of his work colleges from Tetra Pak UK Ltd. (located on Wrexham Industrial Estate) called "2nd Time Round", as that is the music we play (1950' and 1960's). 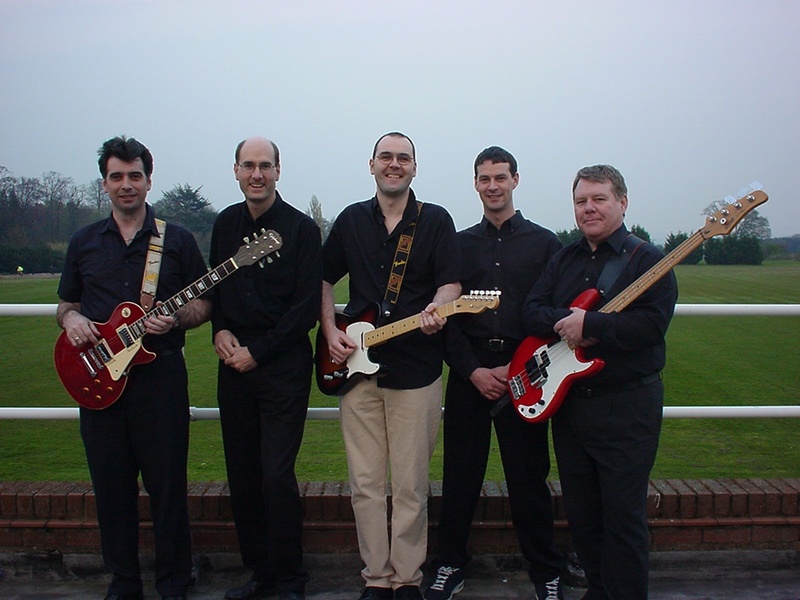 Geoff (drummer) still lives in Wrexham and has a very successful Gas Heating supply/installation business. Tony (lead guitar) lives in Tanyfron. Dave (vocals) when last heard of (some 2yrs ago) has moved to Stock on Trent. Barry (rhythm and vocals) lives in the Gloucester area. Barry Rogers formed Wild Honey, duo in 1997. 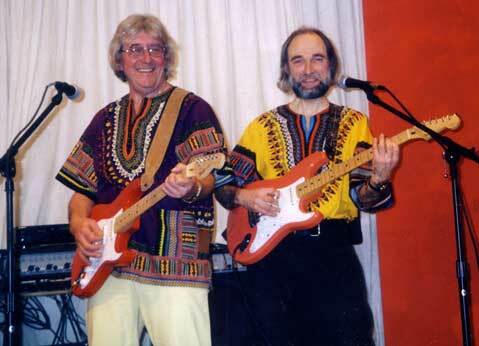 Both Barry and Doug played semi professionally in bands throughout the sixties. 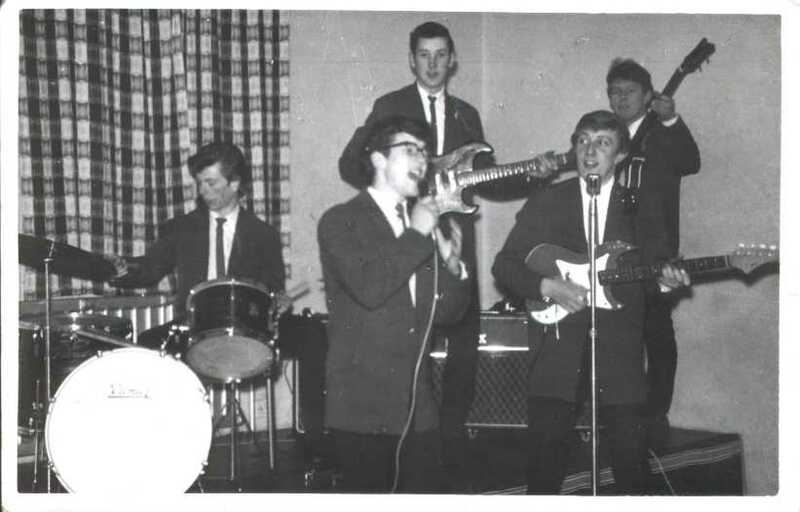 Barry played in a band in North Wales called the 'Aces' and was very much part of the Mersey Scene in the sixties playing on the same bill with many of the big named Liverpool and Manchester bands of the day. Wild Honey plays fender stratocaster electric guitars and for the lighter music uses twelve and six string acoustic guitars. You will need to click on the yellow hyper link Wild Honey from this web site.